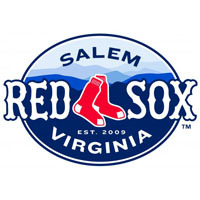 Deadlocked at five through 12 innings, the Red Sox rallied for the go-ahead tally in the top of the 13th, with Sean Coyle’s RBI single plating Michael Almanzar to surge Salem to a 6-5 lead. Trailing for the first time all night, the Dash put the tying man in scoring position with nobody out after Dan Black’s leadoff double in the bottom of the frame. But Sox righthander Andrew Jones retired the next three Winston hitters consecutively, including Miguel Gonzalez’s deep drive to left-center field that Shannon Wilkerson snagged on the warning track for the final out, delivering the conclusion of a four hour and 16 minute journey that the Sox survived by the slimmest of margins. For just the second time all season (and the first time since April 12), the Red Sox won when trailing after eight innings. Coyle led off the ninth with a walk and moved to second on Lucas LeBlanc’s sacrifice bunt. Wilkerson launched a deep fly over Trayce Thompson’s head in center that drove in Coyle to tie the game at five. Although Wilkerson was thrown out trying to stretch his one-out RBI double into a triple, the damage had been done and the Dash went quietly in the last of the ninth. Winston had led 5-1 through six innings before Salem scored three times off Terance Marin in the top of the seventh to inch back within a run. Salem loaded the bases with one out, and Winston could have escaped the threat if Carlos Sanchez tossed a better throw to second on Heiker Meneses’ sharply struck ground ball. But the flip eluded second-baseman Marcus Semien and everyone was safe. Travis Shaw promptly doubled home two runs, but Meneses was gunned down at the plate in his quest to even the score, and the Sox remained one run back. Earlier in the contest, the Dash scored two runs in the first against Charle Rosario, but the Salem spot starter minimized the damage after the first four Winston-Salem hitters reached base. Salem made it 2-1 on Wilkerson’s RBI single in the third, but the Dash jumped to a 4-1 lead on Juan Silverio’s two-run homer in the fourth. Two frames later, the Dash led 5-1 when Mike Blanke took Ruben Flores deep for a solo home run into the outfield bar in left. Undeterred, the Red Sox rallied for three in the seventh, one in the ninth, and one more in the 13th, a comeback enabled by the brilliant work of the bullpen. Making a spot start, Rosario dealt five innings allowed four runs, and gave Salem a chance to win. A trio of relievers followed up by allowing just one run on four hits over eight superb innings. Flores only allowed the Blanke homer in his four frames in the mound, while Mike Olmsted tossed two scoreless, striking out three, and Jones plastered two more zeroes on the board in the 12th and 13th innings, immediately before and after Salem surged in front for the first time. Jones earned the victory to improve to 3-1 on the year, while Jake Wilson suffered the loss for the Dash, falling to 1-1 after he surrendered the game-deciding run in the 13th. Wilkerson led the Red Sox with three hits and two RBI, while Christian Vazquez and Coyle each delivered two hits for Salem, who outhit Winston 13-8. Shaw finished 1-for-3 with his two-run double and three walks. Salem and Winston will enjoy about a 12 and a half hour break before kicking off the series finale at noon on Wednesday. Keith Couch will get the start for the Sox, while Justin Collop will take the mound for the Dash.